If you are up for home décor, make sure that no minute aspect gets neglected. Shower curtains are among those fundamental aspects, which can offer the most eloquent look to your bathroom. A perfectly hanged shower curtains in the bathroom creates an impression. However, it’s a perception among many that the shower curtains can look good only with its generic editions. It’s not always true; one can have a great variety of these curtains in modern times, and all these can look good with a proper decoration strategy. If you are in the hunt of a perfect shower curtains combination, this would be a fine recommendation. Both these colours accompany each other well. It can look even more enchanting if the white tiles are spread across the bathroom. Sea blue curtains in numerous colour prints can be availed from contemporary stores. To be specific, this idea can be effective for smaller bathrooms. Sometimes it is confusing to select the right shower curtains colour at the entrance. Most people simply go for the white in this context. However, if you are looking for something different, light green would be a nice idea. The best part about this colour is its adaptability with both larger and smaller bathrooms. In fact, it can mate well with any tile colour combination. No matter you go with simple white, black, or any other combination, it looks good with all. It can be one amazing combination that you would love to try for your compact bathroom. First of all, black top and white wall look thoroughly accompanying. To make things look catchier, you may turn1/5th of the wall from the top with black tile as well (keeping the rest as white). An orange shower curtains would glorify this brilliant combination in an even enchanting fashion. To make things look fascinating, it is recommended to use golden bars for hanging the curtain or at every other rolling. It would be more eloquent if you install the other accessories, like the taps, soap stand, etc. of golden colour only. If you are running short of ideas or in any confusion, going with curtains with floral prints would be the finest recommendation. You don’t need to think much about the colour combination of the prints on your curtain if the tiles spread are all white. However, it is important to select the right colours for black or any other shed of tiles. Hence, it is safest to go with the lighter floral prints on your shower curtains where the tiles are black or having any similar shed. It’s not just about the shower curtains or other related accessories. Your lighting arrangement is also crucial for having a beautiful interior. Having a bright white light in the background is like a must. 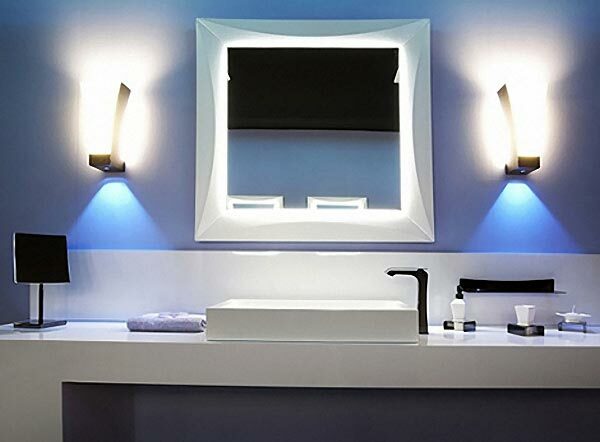 You should allow enough passage of lights inside the bathroom as well.